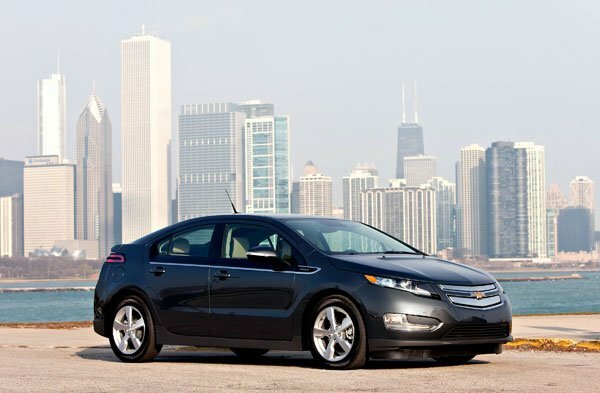 Friend of S:S:L, Christina DesMarais, sends us this report of her drive of the Chevrolet Volt in Chicago. I recently made the eight-hour drive from Minneapolis to Chicago to drive the all-new Chevrolet Volt, the extended range electric vehicle about to start appearing in select cities by the end of the year. Why did I go to all that trouble? First, tickets to the Windy City, usually less than $200 from here, were more than $300 for some reason. Since gas would only cost a little more than $100 I grabbed by husband, got a sitter and we took off for an adventure. The Volt, named car of the year by several magazines, is arguably the most-hyped car around. Let me say that having a first drive in busy metropolis during rush hour wouldn’t have been my choice. Standing at the corner of North St. Clair Street and East Erie Street, I spotted the Volt about a block away. Sleek and sporty, I was getting a white beauty with black accents. Lucky for me, I was the last drive of the day which meant I got to have a few extra minutes with the Volt. The problem, though, is that Chevy had three people in the car—two engineers and a communications person. Counting my husband and me, that made five. The Volt only carries four. Hmmm…who was going to get thrown under the next swiftly passing bus? The PR gal decided to stay behind, letting me keep the two engineers and the guy who drove me eight hours to this engagement. We said goodbye to her and finally, I was adjusting my seat and mirrors ready to drive. Oddly, the first thing I noticed was a hand pump—not a regular electric lever—that I needed to use to adjust the height of the seat. There was a manual latch to move the seat forward or back. Chevy did this to save electricity, which makes sense. After deciding we were going to head to a place near Soldier Field where we could stop and thoroughly check out the car, I put it in Drive and entered rush hour traffic. “I really don’t want to smash up your pretty Volt,” I said, listening to both navigation cues and a quick and dirty feature demo by the engineer sitting next to me pushing buttons on the center consol touch screen so I could just drive. Smooth, quiet and responsive were the words that initially came to mind about how it felt maneuvering the car through traffic. When I hammered the accelerator the Volt took off nicely but even more so once one of the engineers pointed out the car has three modes that adjust the amount of energy available: standard, sport and mountain. Once I switched to sport mode the car accelerated very quickly. In fact, one of the engineers told me that the beauty of an electric vehicle is that all the torque is available right away because the car uses a magnetic coupler that provides electricity immediately. A regular car relies on engine speed to generate torque, and that takes more time. And speaking of it being an electric vehicle, they told me the Volt is an EVER, which stands for Electric Vehicle with Extended Range capability, and not a hybrid, although others call it a PHEV, for Plug-in Hybrid Electric Vehicle. When I was in Tennessee last month driving the Leaf, Nissan complained that the Volt can’t be called an EV because of the regular internal combustion engine on board that kicks in after the first 40 miles. Chevy, though, says that people who have short commutes might never have to use the gas engine. The braking felt different than say, my BMW 328. I guess that makes sense considering the Volt uses a combination of regenerative brakes and conventional disc brakes. During regenerative braking, the electric drive motor direction is reversed which converts g-forces to electric power that is transferred back to the battery, thereby recharging it. While the regenerative brakes handle about 94 percent of braking, the driver would have a hard time modulating them alone. 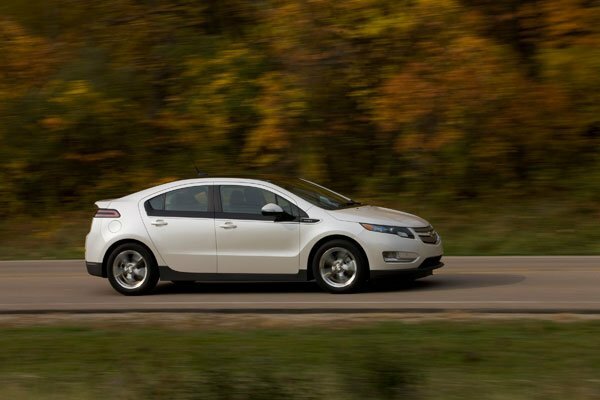 To help with that, the Volt transitions to friction brakes at the very end of stopping (5 mph to 0), or during panic stops. That means that if you slam on the brakes at every opportunity—thinking you’re helping out the battery—you’d be wrong. Gentle and smooth is the name of the game in a Volt. We parked by Lake Michigan and spent some undistracted time thoroughly checking out the Volt. 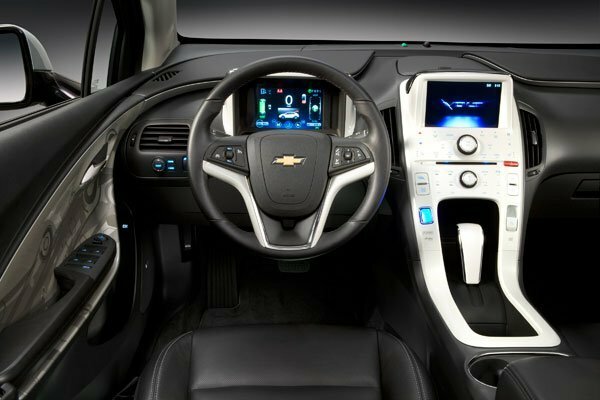 Like many new cars, the Volt lets you make hands free calls using Bluetooth, plug in an mp3 player to access music, or save to music to the car’s hard drive. You can also use smart phone apps to communicate with the Volt and tell it to start charging (if it’s plugged in, obviously) or check the fuel level or tire pressure. And it comes with five years of free OnStar service, which is pretty generous. There are two display screens for the driver to use—one behind the steering wheel and one touch screen on top of the center stack. These screens display loads of information regarding how much energy you’ve depleted from the battery and how much the gas engine is contributing to keeping the battery at a “specified state of charge.” The driver’s instrument cluster displays a little ball that is green when you’re driving efficiently. If you hammer on the accelerator like I did, the ball turns yellow-orange, or what Chevy calls a “scorched earth” color. The Volt’s interior is different. The center stack and door panels are covered in overtly shiny plastic, which you’d think would look cheap but doesn’t. Instead the plastic lends itself to a “hip new invention” feel. It worked for me. While I didn’t sit in the back seat, my husband did and later told me he hit his head twice getting in and out of the car. That could be because the Volt’s T-shaped battery sits under the center consol and passenger seats. About that battery. It has an eight-year/100,000-mile warranty. Once it needs to be replaced, the Volt will need go into a Chevy dealership where they’ll put it up in a hoist and make the swap from under the car. The old batteries can then be repurposed for smart grid energy storage, thereby shaving some cost off the new one. And the Volt’s exterior is sharp. Designed to be aerodynamic, the exterior is less boxy than say, a Prius, and a small fin on the back of the car gives it attitude. The front headlights remind me of the Nissan Leaf’s front view—they almost look mean. The Volt definitely gets attention on the street. While we were parked by the lake a passerby snagged one of my engineers and conducted his own interview. As for fuel economy, the EPA finally just came out with its estimated average. When the battery is fully charged for the first 35 miles the Volt will get a combined city/highway average of a 93 mpg equivalent when using electricity only. 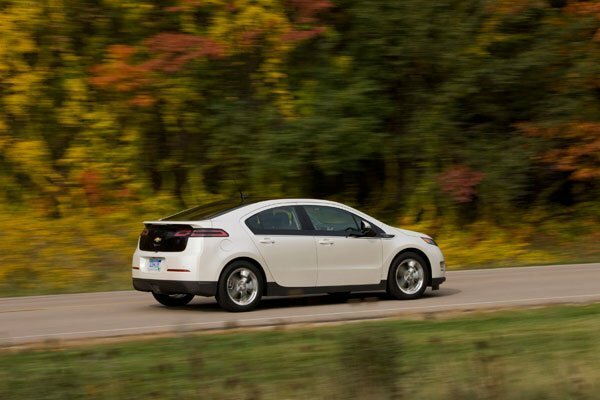 When the electricity is used up, the Volt will get about 37 mpg and run for another 344 miles. Chevrolet plans to make 10,000 Volts in 2011 and 45,000 in 2012 and that doesn’t count GE’s recent commitment to buy 12,000 by 2015. The Volt will begin showing up by the end of this year in seven key markets: Texas, California, New Jersey, New York, Detroit, Washington, D.C., and Connecticut. The rest of the nation will start getting them in the next 12 to 18 months. My husband and I both felt driving eight hours to get in the Volt for 53 minutes was worth it. That, in itself, says a lot.